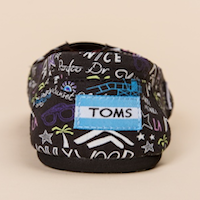 Kitson, TOMS, and Los Angeles are apparently involved in a little love triangle: The trendy retailer and the do-gooder shoe company have collaborated on a new style inspired by L.A. 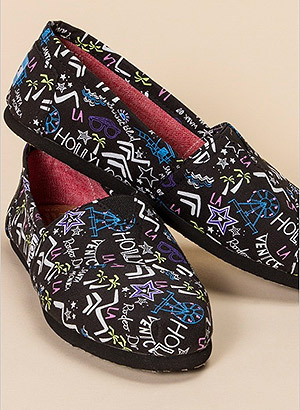 Available exclusively at Kitson stores, the black canvas shoe, which comes in both child and adult sizes ($38 and $58 respectively), is decorated with fun neon designs like sunny beaches, palm trees, and the names of different neighborhoods. Show your L.A. love while helping a child a need.